Our cabin is surrounded by tall pine trees with beautiful views of Georgetown Lake, "moose pond" where moose frequent as well as many birds, and the gorgeous surrounding mountains. Our cabin has a large front deck and a covered porch for outdoor meals. A separate log building houses a rustic wood-fired sauna to relax after the day's adventures. We have a great outdoor fire pit that is so much fun for the entire family to gather around on the long summer nights! The cabin has hardwood and carpeted floors. The main floor has a living room with large picture windows that present an marvelous view with a couple of cozy rockers and binoculars to sit and enjoy scenery and wildlife. The living room has a wood-burning stove, a small work desk and a nice pine queen size inner-spring futon for seating or sleeping, and a TV/ DVD/ VCR that has Dish Network TV programming. The kitchen is equipped with customary appliances as well as a dishwasher, coffee maker, microwave, toaster, and other small appliances. Dishes, cookware and silverware, utensils are provided. We have a nice gas grill just out the door on the covered porch for year-round grillin'. A small dining area is placed in front of the sliding glass doors for another nice view of the lake or access to the front deck. The upstairs bedroom is very spacious and has a California King bed you can lay in and enjoy looking at the lake! There is also a twin sized day bed in this bedroom. The bathroom upstairs is accessible from the main bedroom and the kitchen. Linens and towels are provided. A spiral staircase takes you downstairs. The lower level has large sliding glass doors for easy access from the parking area at ground level. The family room downstairs offers a wet bar with a sink, a new queen inner-spring futon, a leather rocking recliner and a table with chairs for four to play one of the many games we have in the cabin. In addition to the games, the downstairs recreation room has a TV with DVD for hanging out and watching one of our many movies. Around the corner is a bedroom with 2 twin beds and the bathroom with a very oversized cedar shower. The laundry facilities are also downstairs. Well- behaved pets are allowed. Our cabin will accommodate up to eight people. We are bordered by USFS land to the west and the lake is across the road from the cabin. The 7 Gables resort is about one block from the bottom of the driveway. Discovery Ski area is up the road about 6 miles. Our cabin is easy to find and really accessible for all activities. We have parking for your boat or snowmobiles! 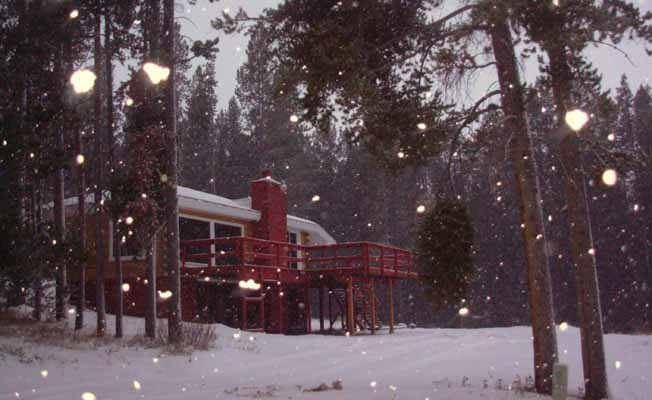 Start your snowshoeing, cross country skiing, or snowmobiling trip right from the cabin. If your bringing a boat, kayak, or canoe, there are 2 public boat launches within 1 mile of the cabin.